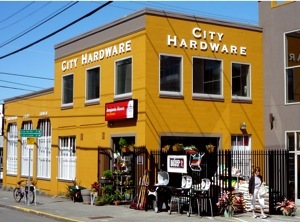 City Hardware is your neighborhood hardware and general store in the city - locally owned and operated! Located in the rapidly renewing South Lake Union area, we opened our doors in September 2007 to serve the needs of downtown residents and businesses by providing access to more than 75,000 quality items - everything you need to keep your space working and looking great! We are also downtown Seattle’s only independent hardware store and Benjamin Moore Paints dealer; as well as your neighborhood general store, stocking diverse wares like canning supplies, bicycle accessories, personal grooming products from Burt’s Bees, coffee grinders and makers, vacuums, reading glasses, greeting cards, USPS stamps and more! Please stop by and say hello! We look forward to helping you. City Hardware is a Benjamin Moore Paints store, as well as an authorized Miele vacuums, Weber grills, Easy Track closet organization systems and Levolor blinds dealer! Wondering what’s new at your favorite store? (ahem...that would be us.) Sign up for our monthly New Items email newsletter here! Welcome to Seattle’s hardware & general store...City Hardware! Thank you, Seattle, for 7.5 fun years! For all your hardware and Benjamin Moore Paint needs, please visit our friends at Homebuilder’s Center on Nickerson Street - just 3 miles from our store, on the right before the Ballard bridge. And for City Hardware paint customers with color formulas that were kept on file, Homebuilder’s Center is a full-service Benjamin Moore Paints store, and has our customer database of saved colors, so no need to panic - just tell them you were a City Hardware customer!